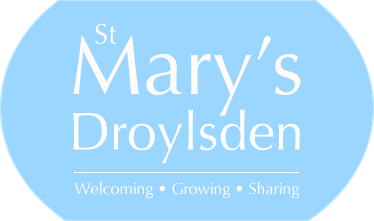 Welcome to St Marys Droylsden, a thriving Christian community which lives for the glory of God. St. Mary’s is a welcoming Anglican church, serving the communities of Droylsden and Audenshaw in the borough of Tameside in Greater Manchester. We warmly welcome you to join our diverse community – a family of people of all ages and outlooks. Our aim is to be a church in which Jesus is the centre, where people are encouraged to grow in faith and develop in their relationships with the Lord and with one another. Where we reach out to share God’s love with the community around us. So, whether you are starting to explore your faith, are new to the area, want to make new friends or have been a Christian for a long time, we would love to meet you.